The “MyoVision Scanner” ‘reads’ your spine and reveals any irregularities or imbalances which may be the cause of problem. Your pain or problem may not be directly in your spine or even in your back. No matter where you feel aches and pains, they can often still be traceable to the spine, the origin of most of your body’s nervous system. The scanner detects problems and acts like a guidebook or road map for us – which, when combined with the proper chiropractic adjustments will give you the best opportunity for healing. The MyoVision Scan takes less than 5minutes to perform; it is radiation free and non-intrusive and is a vital part of our new patient exam. You’ll receive a written report and a copy of your scan on your second visit. You will be able to see images of what is happening in your body and understand the care plan that has been set for you. 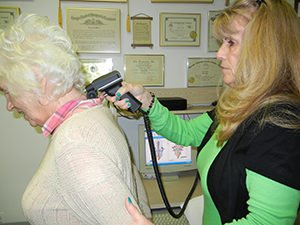 The MyoVision Scan is also used to reassess progress after the initial course of chiropractic care.